This article is about mining for salt. For the secret CIA prison, see Salt Pit. Before the advent of the modern internal combustion engine and earth-moving equipment, mining salt was one of the most expensive and dangerous of operations, due to rapid dehydration caused by constant contact with the salt (both in the mine passages and scattered in the air as salt dust), among other problems borne of accidental excessive sodium intake. While salt is now plentiful, until the Industrial Revolution it was difficult to come by, and salt mining was often done by slave or prison labor and life expectancy among those sentenced was low. In ancient Rome, salt on the table was a mark of a rich patron; those who sat nearer the host were "above the salt", and those less favored were "below the salt". The Roman historian Pliny the Elder stated as an aside in his Natural History's discussion of sea water, that "[I]n Rome ... the soldier's pay was originally salt and the word 'salary' derives from it ..."
Ancient China was among the earliest civilizations in the world with cultivation and trade of salt mining. They first discovered natural gas when they excavated rock salt. The Chinese writer, poet, and politician Zhang Hua of the Jin Dynasty wrote in his book Bowuzhi how people in Zigong, Sichuan excavated natural gas and used it to boil a rock salt solution. The ancient Chinese gradually mastered and advanced the techniques of producing salt. Salt mining was an arduous task for the ancient Chinese, who faced geographical and technological constraints. Salt was mainly extracted from the sea, and salt works in the coastal areas in late imperial China equated to more than 80 percent of national production. In conjunction with this, the Chinese made use of natural crystallization of salt lakes and constructed some artificial evaporation basins close to shore. In 1041, during the medieval Song dynasty, a well with a diameter about the size of a bowl and several dozen feet deep was drilled for salt production. In Southwestern China, natural salt deposits were mined with bores that could reach to a depth of more than 1000 meters but the yields of ground and salt were relatively low. As salt was a necessity of life for human civilization, salt mining played a pivotal role as one of the most important sources of Imperial Chinese government revenue and state development. Most modern salt mines are privately operated or operated by large multinational companies such as K+S, AkzoNobel, Cargill, and Compass Minerals. The Crystal Valley region of the Khewra Salt Mines in Pakistan. With around 250,000 visitors a year, the site is a major tourist attraction. Bulgaria Provadiya; and Solnitsata, an ancient town believed by Bulgarian archaeologists to be the oldest in Europe and the site of a salt production facility approximately six millennia ago. Canada Sifto Salt Mine in Goderich, Ontario, which, at 1.5 miles (2.4 km) wide and 2 miles (3.2 km) long, is one of the largest salt mines in the world extending 7 km2 (2.7 sq mi) . England The "-wich towns" of Cheshire and Worcestershire. Ethiopia, Eritrea, Djibouti Danakil Desert, where manual labor is used. Italy Racalmuto, Realmonte and Petralia Soprana within the production sites managed by Italkali. Morocco JMS salt mine in Khemisset. N. Ireland Kilroot, near Carrickfergus, more than a century old and containing passages whose combined length exceeds 25 km. Pakistan Khewra Salt Mines, the world's second largest salt-mining operation, spanning over 300 km. Poland Wieliczka and Bochnia, both established in the mid-13th century and still operating, mostly as museums. Kłodawa Salt Mine. Romania Slănic (with Salina Veche, Europe's largest salt mine), Cacica, Ocnele Mari, Salina Turda, Târgu Ocna, Ocna Sibiului, Praid and Salina Ocna Dej. Hutchinson, Kansas, Underground mining began at Hutchinson in 1923. In 1990 the Hutchinson Salt Company was formed and purchased the mine. Western New York and Central New York, location of American Rock Salt, the largest operating salt mine in the United States with a capacity for producing up to 18,000 tons each day. Syracuse, New York earned the nickname "The Salt City" for its salt mining, an activity that continues in the region to the present day. Houston, Texas, near Minute Maid Park is a newly discovered saltworks. Grand Saline in East Texas has a Morton Salt mine. It is one of the largest in the world. Saltville, Virginia, which served as the site of one of the Confederacy's main saltworks. ^ "Oilfield Glossary: Term 'evaporite'". Glossary.oilfield.slb.com. Retrieved 2012-02-13. ^ "''Plinius Naturalis Historia XXXI.''". Penelope.uchicago.edu. Retrieved 2012-02-13. ^ a b Harris, Peter (2017). Studies in the History of Tax Law. 8. Hart Publications (published August 10, 2017). p. 518. ISBN 978-1509908370. ^ a b Deng, Yinke (2011). Ancient Chinese Inventions. p. 41. ISBN 978-0521186926. ^ a b c Höllmann, Thomas O. (2013). The Land of the Five Flavors: A Cultural History of Chinese Cuisine. Columbia University Press (published November 26, 2013). p. 33. ISBN 978-0231161862. ^ Maugh II, Thomas H. (1 November 2012). "Bulgarians find oldest European town, a salt production center". The Los Angeles Times. Retrieved 5 December 2012. ^ "Industries in Godrich". Archived from the original on December 26, 2007. Retrieved 2008-02-08. ^ "CBC-TV - Geologic Journey - Goderich, Ontario and Detroit Michigan". CBC 2012. Retrieved 3 August 2012. ^ "Salt mine in the Danakil Depression in Ethiopia, 2015". Independent Travellers. independent-travellers.com. Retrieved July 14, 2017. ^ "Italkali Spa - Production Sites". Archived from the original (online) on 2012-03-31. Retrieved 2011-05-09. ^ "The Detroit Salt Company -- Explore the City under the City". Archived from the original (online) on 2009-04-12. Retrieved 2008-02-08. ^ Spector, Joseph (13 Jan 2015). "American Rock Salt to expand in LIvingston". Democrat and Chronicle. Retrieved 20 July 2015. ^ "All 17 Cargill Salt Miners Trapped on Underground Elevator Freed". NBC News. January 7, 2016. Retrieved January 7, 2016. 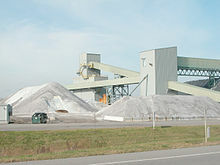 Wikimedia Commons has media related to Salt mining. This page was last edited on 24 January 2019, at 11:56 (UTC).